Drawings from the holidays are up! Hey everyone! I’ve updated my website, so you can see my newest chalk drawings! I also put up a logo I did for the production company Mike and I created on my Photoshop and Illustrator page. Unfortunately the real logo we used is having technical problems, so I will hopefully get that one up soon! Well I hope you enjoy! Comments are always appreciated of course 🙂 I’m still working on the website itself, but at least my artwork is up! There will be more to come. 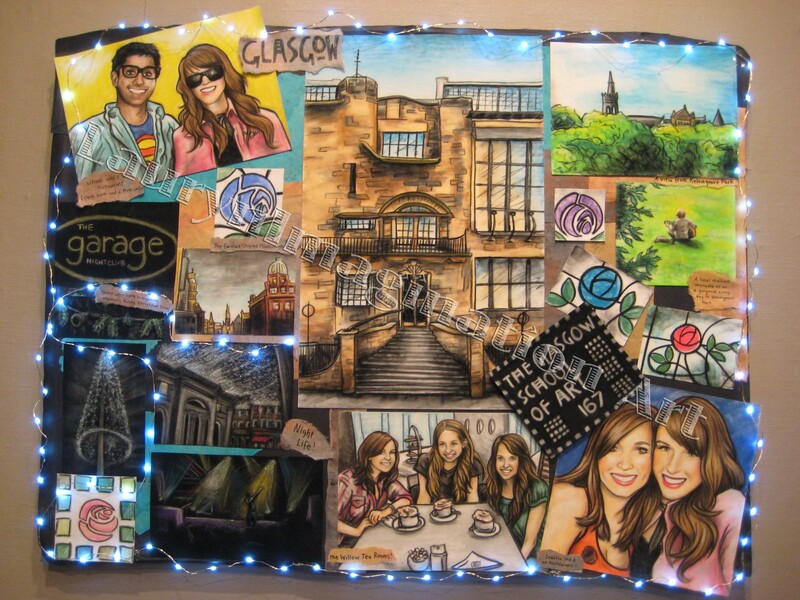 Throwback to my artwork illustrating my time spent studying abroad in Scotland. The Glasgow School of Art has such a special place in my heart. 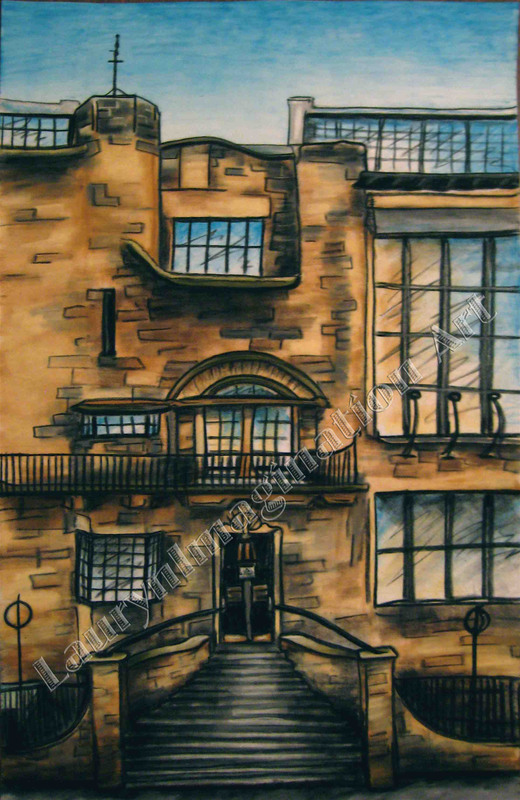 The famous, incredible Mackintosh Building will always be amazing and unforgettable. Here’s to you, Glasgow. I entered a t-shirt design contest and…I won! Hey! I have some exciting news! Not only do I have new artwork up (check the graphite page, the chalk pastel page, and the mixed design and illustration page), but I also won a design contest! 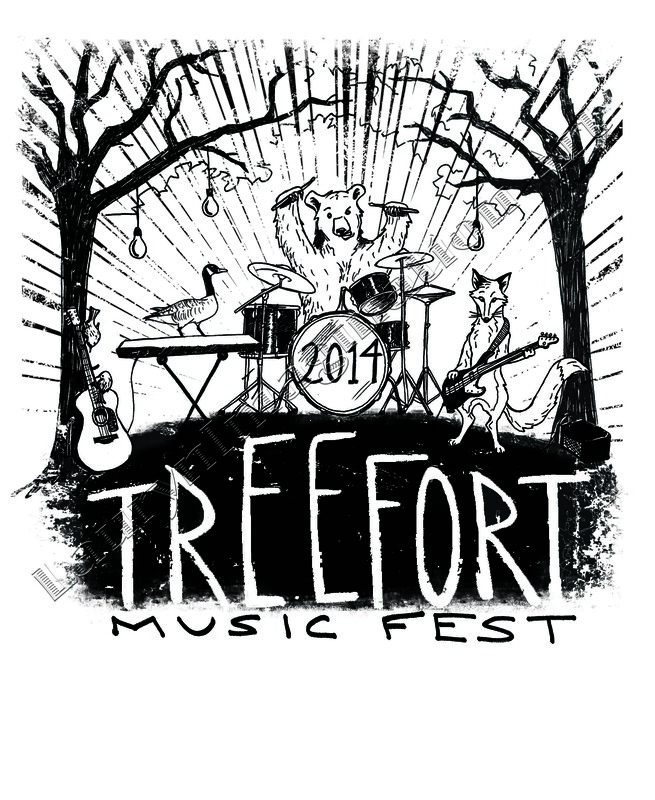 This year Treefort held a t-shirt design contest for the main t-shirt featured at their live screen printing booth in the main stage area. I was so excited I immediately started gathering ideas and sketches – I wanted to make something trendy, exciting and illustrative. They picked 5 finalists for the public to vote on, and mine ended up winning! I’m thrilled to be a part of such an awesome event and to be able to show Boise what I can do: illustrate and design. 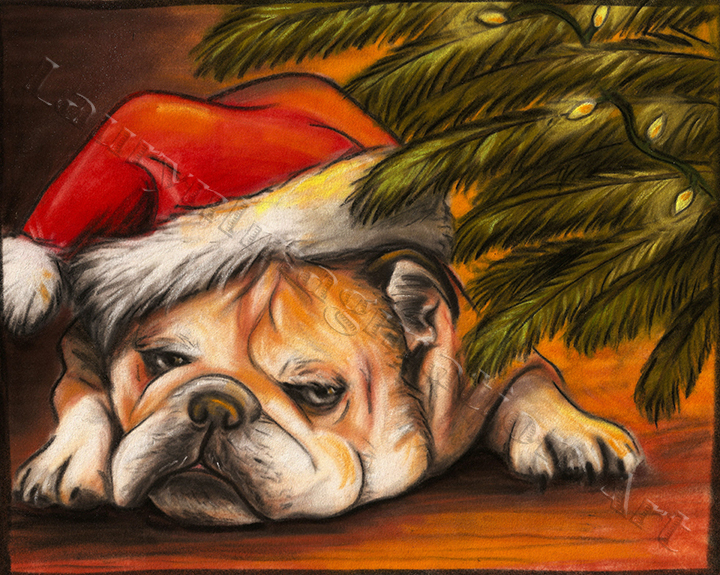 Meet Frank, a tired old bulldog who has had enough Christmas cheer. 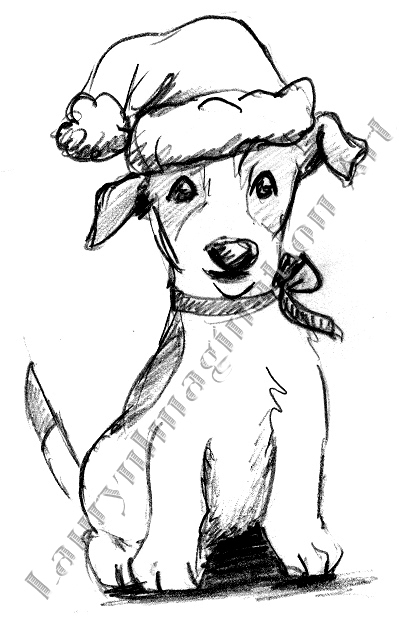 He is just one of my new holiday drawings I’m working on – I have had a few people ask me to draw their dog with a Santa hat on (inspired by my doggie holiday card last year – you can find that on my “Photoshop and Illustrator” page). 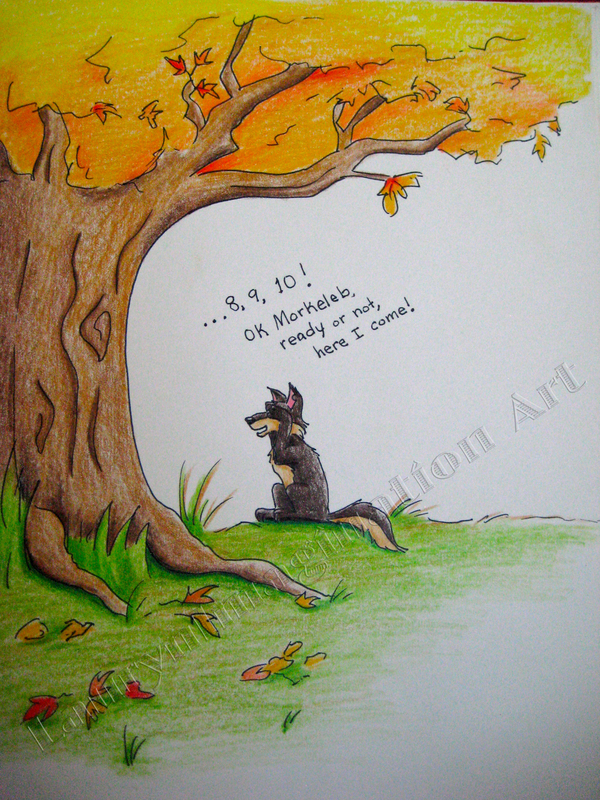 Be sure and check out my graphite page, chalk pastel page, and my t-shirt designs as well – there is new artwork up! Drawing I did for Angela R. Stewart Design, Inc. Client wanted our previous holiday card personalized with her own dog. 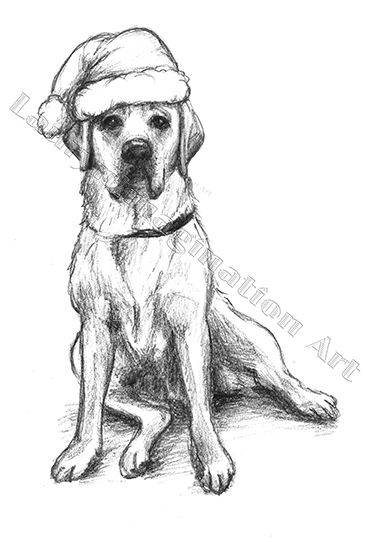 If you would also love to have a drawing done of your dog or a friend’s dog with a Santa hat on, please let me know! I can do any style you want, more realistic, cartoony, chalk pastel, graphite, take your pick! Thanks for checking out my website, I hope you have a wonderful holiday season! Updated pages and new artwork! Hey guess what? I have new artwork up! 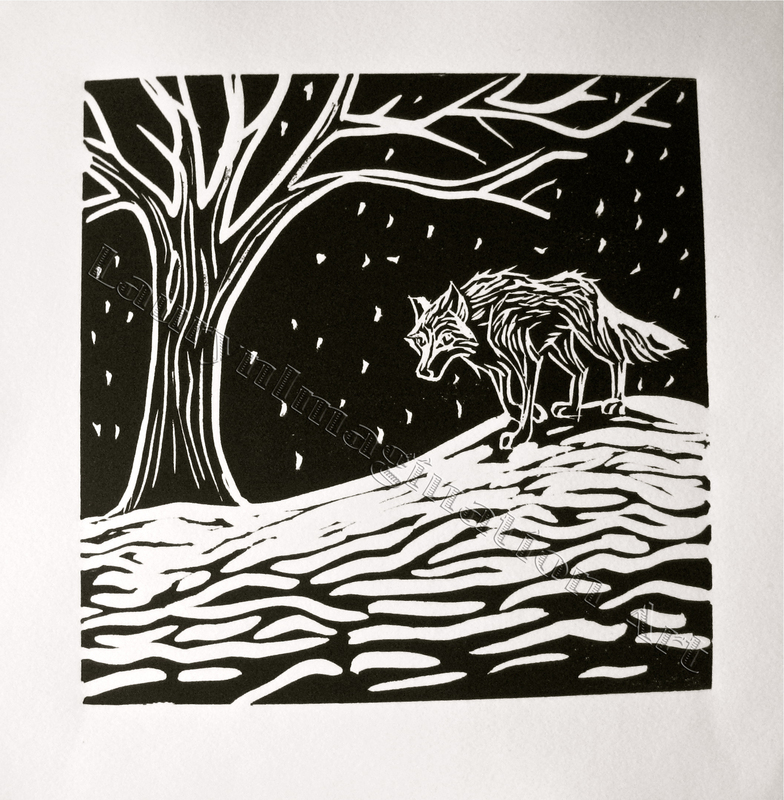 I have updated a few things, as well as adding to pages – I put up my printmaking, illustrations, photography, t-shirt designs and a few drawings and sketches. Check it out! I finally made a children’s book! After the big move to Boise, I can proudly say that I have accomplished a great deal of work so far. I’m taking a Creative Photography Class where we are working with film cameras (super exciting! ), a 3D art course involving found materials, and a design/graphic design internship at Angela R. Stewart Design, Inc. Besides all the amazing projects I’ve gotten to work on for Boise State University and my internship, I have also been doing some of my own photography for fun as well as book illustrations for a family friend’s book on auto care. I hope you enjoy all my newest pieces, I certainly enjoyed working on them!! Book Cover Art and Illustrations! Hey Everyone! So….The book cover art and illustrations I have been working on this summer are finally uploaded! I just finished these last week – it has been so exciting to be a part of such an amazing opportunity to get my artwork out in the open. Thanks Donna McCord! Self Portrait plus Mixed Media artwork up! I also finally put up the mixed media card I did for Mike, as a one-year anniversary gift. It’s always fun to make cards instead of buy them, and for this special occasion, I was inspired by my work at Drawn2Art. I wanted this card to be extra special, yet with a funny, silly and colorful mood. I’ve been working with a lot of different mediums that I usually don’t work with on my own time. These include: colored pencils, watercolor, watercolor crayon and pencil, markers, and many others. 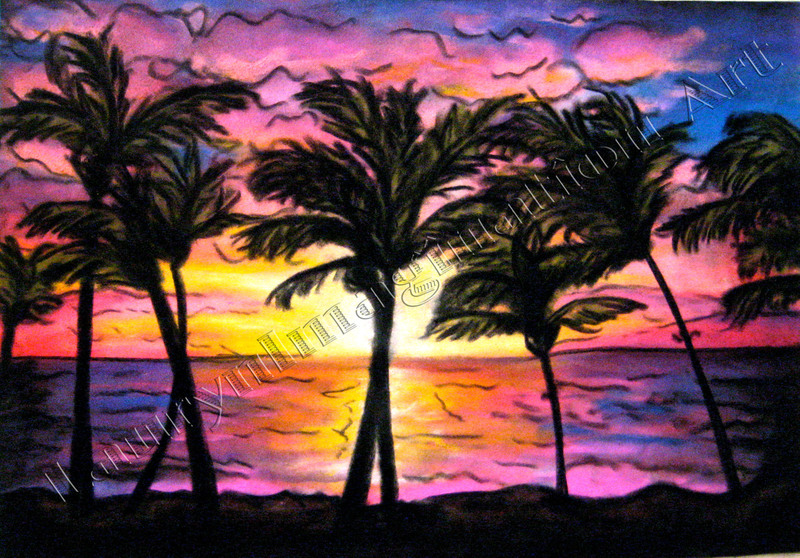 As you may know from my website, my absolute favorite medium is chalk pastel. Working at Drawn2Art has helped me come to love other mediums just as much, and has challenged to use them at home in addition to work! I hope you all enjoy these new additions to my website, I will be putting up more artwork soon! 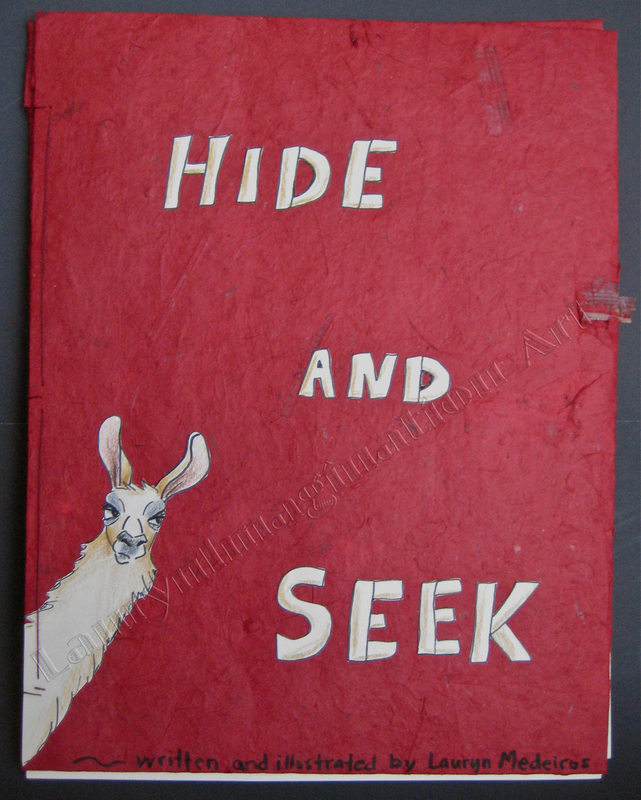 I’m currently working on book covers, llama comics, and portraits…stay tuned! !